The 30% Tax Rebate is back! Ask for details! 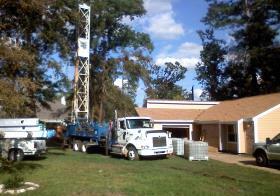 Geothermal Heating and Cooling can be adapted to so many situations it is hard to list. See our FAQ page for better details. 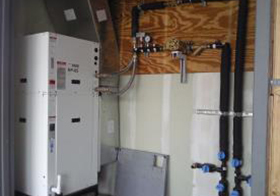 Generally, Geothermal or Ground Source Heat Pumps utilize the Earth’s constant temperature (70-72 degrees in South Texas) to absorb heat , or dispose of heat to heat or cool your home. This is done through a series of underground water loops, or via well water, a pond, or even a swimming pool! 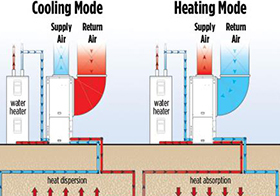 Simply put, when cooling….What do you think would take less energy, to transfer heat from you house to 70 degree dirt or 95 degree summer air? 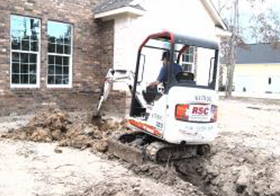 Obviously much less power is needed to transfer your home’s excess heat to 70 degree soil, than 95 degree air. In heating mode, how much energy does it take to transfer 70 ground temp to warm your home to ….well 70? Not much! New units achieve comparable SEER ratings of 35+, and can produce 5 units of heat, for every unit of heat energy applied! 2) Open loop systems: Basically take water from the ground, (well water) use it to heat or cool your home, and then dump the water, to a pond, ditch, or sometimes to an injection well, the opposite of a water supply well, that returns water back to the aquifer it came from, un touched, other than warmer or cooler than it’s original temperature. PROS: Lower up front cost CONS: Water waste, system subject to ground water chemistry, adds load to water well. 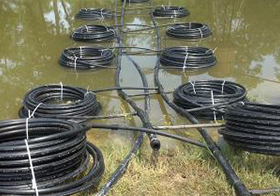 3) Pond loops: A closed loop similar to an in ground loop, but uses piping on the bottom of a pond for heat transfer. PROS; Lower up front cost CONS: Need a pond close to house! 4) Pool loop: Not fully accepted in the geo community, but still effective. 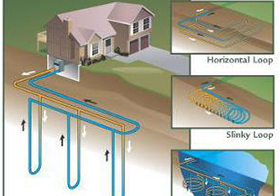 Similar in concept to the pond loop, but uses your swimming pool for extracting or depositing heat. Your pool will super cool in the winter (45-49 degrees) but warm early in spring, and stay warm later in fall for extended swimming season. Depending on size of pool, may require a ground loop to supplement, and a pool evaporative cooler in summer. . PROS: Lower up front cost, Helps heat pool in early/late season CONS: May over heat pool in summer, pool alone may not handle heat load. 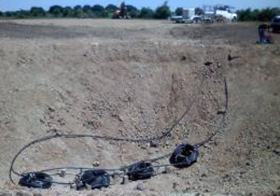 Installing Ground loops is ...well … a lot of digging work. 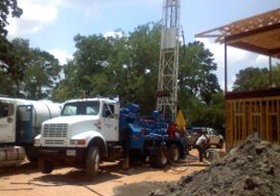 Drilling is the heart of the geothermal business in Texas. 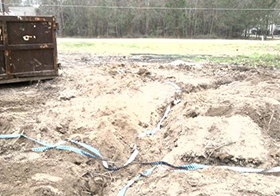 Pond loop geothermal loop system, installed before pond is filled, in this case. This system is for a 3000 sq ft home. A geo unit installed on a commercial job. Note the circulating pump, and service flush valves. Ditches for 4 bores are backfilled to last 12” and then metallic marker tape is installed for future location, if necessary, by meter. 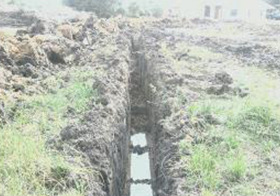 This job was installed not in vertical drilled bores, but in long horizontal trenches. 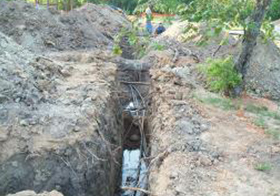 This job used four trenches, 5’ deep, 220’ long, with 4 pipes in each trench. 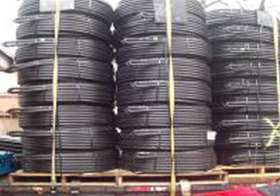 An 11 ton pond loop system being floated out before filling with water to sink. Note loops are weighted with blocks to barely float when dry, and sink when filled.